Haddon Hall near Bakewell, in the Peak District is an architectural gem. Dating back to the eleventh century, the hall has been described as "the most complete and most interesting house of [its] period", it is the finest example of a medieval manor house currently in existence in England. The hall is one of the seats of the Dukes of Rutland and lies alongside the River Wye. It is attractively situated on a sloping site, and is structured around two courtyards; the upper (north-east) courtyard contains the Peverel or Eagle Tower and the Long Gallery, the lower (south-west) courtyard houses the Chapel, while the Great Hall lies between the two.The current medieval and Tudor hall includes additions added at various stages between the thirteeth and the seventeenth centuries. The Domesday Book records that the manor of Nether Haddon was held by William Peverel in 1087, Peveril was a Norman knight who was reputed to be the illegitimate son of William the Conqueror. Haddon was forfeited to the Crown in 1153. 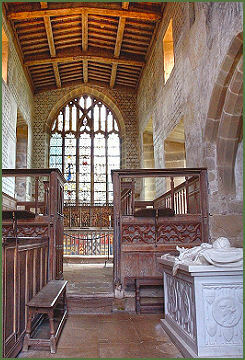 It was passed to a tenant of the Peverils, William Avenal, and was acquired in 1170 by Vernon family, through marriage of Richard Vernon to the daughter of Avenal. The Vernons were responsible for most of the buildings at Haddon Hall, apart from the Peveril Tower and part of the Chapel, which were already existed in 1170. Though never a castle, the manor of Haddon was protected by a wall after Richard Vernon received licence to build one in 1194. Sir William Vernon, a High Sheriff of Lancashire and Chief Justice of Cheshire, a younger son of Warren Vernon, 4th Baron of Shipbrook, acquired the manor by his thirteenth century marriage to the Haddon heiress. Sir Henry Vernon of Haddon, was governor to Prince Arthur, the brother of the infamous King Henry VIII. His son, another Sir Henry, was appointed high steward of the king's forest in the Peak by Henry VIII. Sir George Vernon (c. 1503 – August 31, 1565) had two daughters, Margaret and Dorothy. Dorothy married John Manners, the second son of Thomas Manners, 1st Earl of Rutland in 1563. Sir George is said to have disapproved of the union on religious grounds (the Manners were Protestants, while the Vernons were Roman Catholics) Legend relates that Sir George ordered John Manners to cease courting the beautiful Dorothy and forbade his daughter from seeing Manners. In the course of a ball at Haddon Hall, given to celebrate the marriage of her elder sister in 1563, Dorothy slipped away and fled through the gardens to meet Manners by a footbridge, the couple then eloped. Dorothy was in time forgiven and two years later Dorothy and John Manners inherited the estate on the death of her father. Their grandson, John Manners of Haddon, inherited the Earldom in 1641, on the death of his distant cousin, George, the 7th Earl of Rutland. When he succeeded to the title of 1st Duke of Rutland in 1703, John Manners moved to Belvoir Castle in Lincolnshire and his descendants used Haddon Hall seldomly, it remained unaltered in its sixteenth century condition, just as it had appeared when it passed in 1567 by marriage to the Manners family and thus escaped the major architectural changes of the eighteenth and nineteenth centuries . In the 1920s, John Manners, 9th Duke of Rutland, realised the uniqueness of the building and began a course of meticulous but sensitive restoration, aided by the architect Harold Brakspear. Haddon has received a number of royal visits, George IV once spent the night at the hall when Prince of Wales and slept in the green silk bed in the state bedroom. King George V and Queen Mary also visited Haddon Halll, their signatures may be seen over the fireplace in the Earl’s apartments. The current medieval and Tudor Haddon includes small sections of the eleventh century structure, but mostly comprises additional chambers and ranges added by the successive generations of the Peverel, Avenel, Vernon and Manners families. 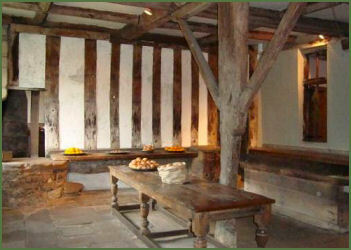 The impressive banqueting hall with its minstrels' gallery and raised dias (pictured above right), the kitchens and parlour date from 1370. The St. Nicholas Chapel (above left), situated to the right of the courtyard, was completed in 1427, and still appears much as it did in medieval times, the chapel contains a beautiful carved alabaster retablo, bold Norman arches, fifteenth century painted glass and fascinating pre-Reformation frescos which have been revealed from beneath the whitewash which concealed them for centuries. The huge kitchen complex (above right) is one of the most fascinating parts of the hall. There are wooden blocks, work surfaces, through which holes have been worn by constant chopping and pounding, a chunk of oak that served as a chopping block, a well equipped bakery and butchery. The Dining Room, a fine oak paneled room, a Gothic window of eight lights is filled with glass arranged in a geometric pattern. In some of the lights are shields of arms in stained glass, one containing the Vernon quarterings. The room contains miniature portraits of King Henry VII and his Queen, Elizabeth of York. 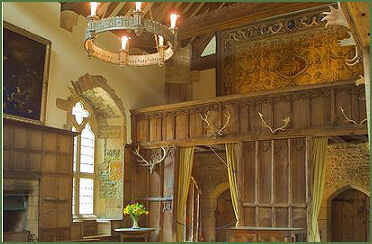 There is a sixteenth century oak panelled Long Gallery which measures 110 feet in length and 17 feet in width. Haddon boasts a superb collection of English, Flemish and French tapestries, the most important of these are five early seventeenth century English tapestries which may have once belonged to King Charles I. The hall is surrounded by attractive terraced Elizabethan gardens which run down to the River Wye. 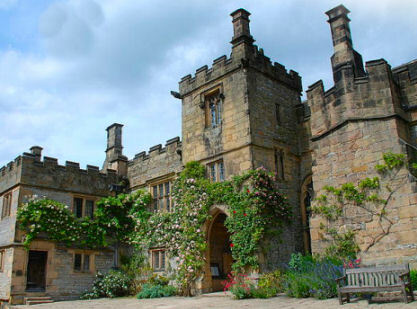 Over recent years Haddon Hall has provided a popular location for film and television productions, including "Elizabeth", "Jane Eyre", "The Prince and the Pauper", "Moll Flanders" and "Pride and Prejudice" starring Keira Knightley, Matthew MacFadyen, and Dame Judi Dench.